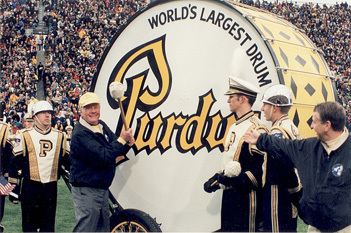 Neil Armstrong had the rare honor of hitting the Purdue “All-American” Marching Band’s Big Bass Drum at a game in 1999. Gold & Black Illustrated President and Publisher Alan Karpick reminisced about his one brief encounter with Purdue hero and astronaut Niel Armstrong on GoldandBlack.com. Armstrong, a 1955 Purdue graduate and former All-American Marching Band member, passed away on August 25 at the age of 82. Read more….